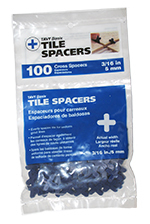 TAVY Basix Tile Spacers are traditional cross-spacer now available in TAVY Color-Code core sizes. As with all TAVY Spacers, Basix float in water for easy clean-up and reuse. No more fumbling through the bottom of a murky bucket to see what lies beneath. © 2017 TAVY Enterprises, LLC. All rights reserved.